…going to cause a stir in hipster-central on Friday, July 15th at the LA tastemaker of venues, Silverlake’s The Satellite. 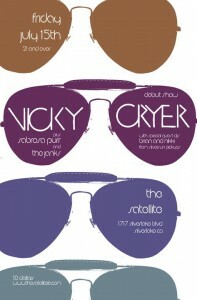 A brand new project (I guess it’s okay to call them supergroup) under the moniker Vicky Cryer will be taking the stage. Ooh la la, I say. Now expect the musically inclined, as well as the downright curious, to be in the house as Vicky Cryer is comprised of some no-joke musicians that we’ve all heard/seen once or twice at a concert or while digging the tunes in our iTunes library. Jason Hill of San Diego’s defunct Louis XIV sifted through his rolodex and recruited friends Jeff Kite for keys (of Julian Casablancas’ band), Mark Stoermer on bass (from The Killers), and- get this- Dominic Howard (Muse) and Alex Carpetis (yet another from Julian Casablancas’ band) on drums. Say what, now? “We’ll have two drummers, one left-handed and one right, mirroring each other onstage,” he says. “It’s like thunder. The power is ridiculous.”…Jason Hill, Buzzbands LA.